​With the sound of the Salvation Army brass band and the smells of mince pies and mulled wine, Sale Moor was certainly the place to be this Sunday for their Christmas Lights switch on. From 5.30 onwards, the Warrener Street car park was alive with music, food, drinks and merriment. 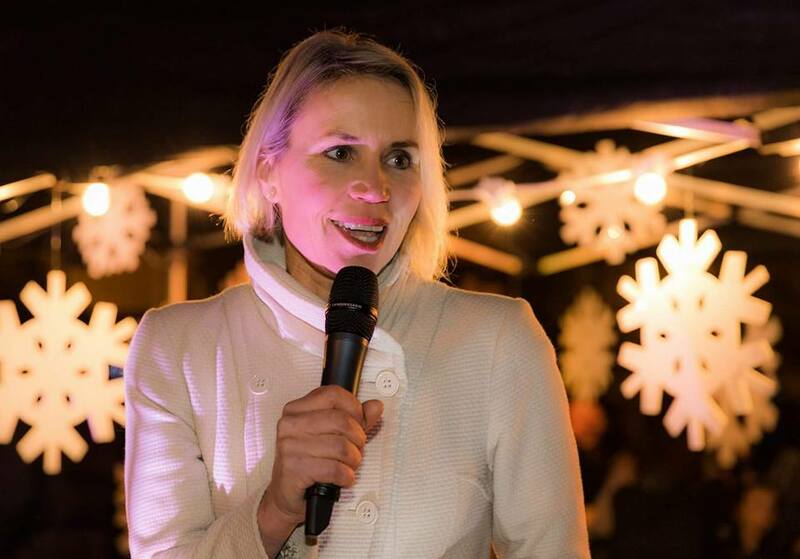 Excited children (and some grown-ups) eagerly greeted Father Christmas and the local residents were excited to welcome BBC North West Tonight’s Dianne Oxberry to perform the honour of switching on the lights. The Mayor of Trafford and local Councillors were also in attendance. ​​Despite a few issues with the power supply being cut shortly before the switch on was due, the crowds of around 600 or so people were in good cheer. Thankfully power was restored in time for the speeches and switch on. We Are Sale Moor Chairwoman Anna Bond introduced the Mayor of Trafford, Councillor Judith Llloyd who congratulated the community volunteers for their hard work, saying “volunteers are the backbone of our society”. The Mayor then handed over to Dianne, who was amazed at the number of people who had turned up to support then event, saying “this is a true celebration of this community and has proven you can do anything you put your mind to”. ​The event was extra special as the community have raised the funds for the Christmas Lights themselves, with pledges via a Crowdfunder campaign, collection boxes in local shops and donations from local traders. The ‘We Are Sale Moor’ community group of volunteers organised the switch on event as a way of saying thanks to everyone who has supported the campaign and to bring the community together. If anyone would like to know more about activities and events in Sale Moor or plans for the future of the Warrener Street car park, you are invited to go along to the Legh Arms on 7th December at 7:30pm for the next public meeting. Alternatively, you can contact us via our contact page.